Everyone needs to learn math. Everyone needs to know how to count, even if it’s just the most basic level of addition and subtraction. Sometimes, when you are sitting with your young one, they need entertainment. How about an app that teaches your children basic math and numbers? iGoMath123 is a iPhone, iPod touch, and iPad app that attempts to teach your children how to recognize numbers, process equations, and even learn how to pronounce the numbers in 5 languages! iGoMath123 is released by iGoTeacher.com for $1.99. First off, the grammar in the title is silly, but the math teaching aspect of iGoMath123 is what is important here! 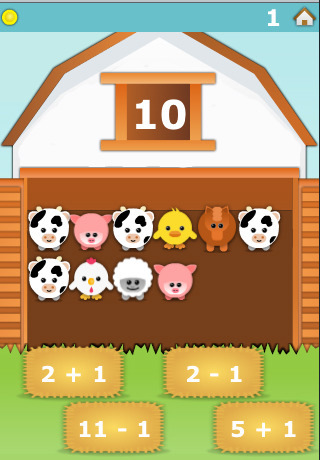 This app introduces 5 different game modes: Escaping Animals, Addition Orchard, Feeding Time, Counting Sheep, and Sequence of Bricks. In Escaping Animals, you lost some sheep and you have to count how many you have left. 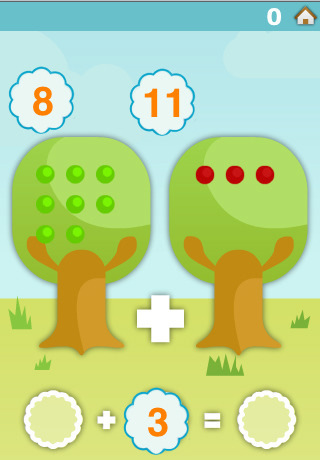 With Addition Orchard, you use math to count how many fruits are there in total. Feeding Time is where you choose the proper equation haystack that equals the number of animals in a barn you need to feed. Counting Sheep is just a counting tutorial where you can hear 1-20 counted outloud. Finally, you have Sequence of Bricks, a game where you order the numbers on bricks in order of smallest to biggest. Each game seems to work pretty well. Granted, I don’t know how effective it really is for teaching little kids, but all the games work properly, no crashes. Some games require dragging objects into another area to, say, complete an equation or stack bricks. The problem is sometimes the object detection can be sketchy and inaccurate, resulting in some unexpected incorrect answers. This can be confusing since you could answer the question correctly and get told you were wrong anyways. My favorite game was, surprisingly, Counting Sheep. You see, this game contains 5 languages: English, Spanish, French, Italian, and Polish. When playing Counting Sheep, they state the numbers outloud in a clear human voice. I found it really nice to be able to learn how to count to 20 in 5 different language. Nice touch, however intentional. Overall, this was clearly not the game for me. I personally found the levels to be perfectly functional, but boring. I don’t know how you make a game system like this entertaining, but the fundamental flaw is that they have a game where you count sheep. If that doesn’t put your kids to sleep, then learning math via an iDevice will. I’m thinking different characters, more cute animals like from the Feeding Time game, and maybe more interesting areas could help shake things up a bit. Educational, nicely drawn, decent audible speech, and multiple languages to help you learn 4 new ways to count? That adds up to a decent game with tons of potential. AppSafari review of iGoMath123 was written by Joseph Ho on November 10th, 2010 and categorized under App Store, Education, Games, Mini Games. Page viewed 3634 times, 2 so far today. Need help on using these apps? Please read the Help Page.